Finally. This book took some work to get through. Published in 1933 I was surprised, initially, at how much humor could be found in the book. Not to say that people in the 30's weren't funny, or maybe its just that my prior reading experience stops at about 1918-20 and skips ahead to the 40's. Another thing I was surprised by was Tarkington's use of a few bad words and the inappropriate use of God's name. In my mind, generations prior to the 50's were of a more noble and genteel sort and such language somehow seems beyond them. Given the fact that there really is nothing new under the sun, I know I shouldn't be taken aback. However, I always am. Not to say this book was loaded with language issues, because it wasn't. It just came as something of a shock to my system the few times I ran across it. The book is certainly NOT to be avoided based on that fact alone. This book was written by Booth Tarkington, who wrote two Pulitzer Prize winning novels, The Magnificent Ambersons and Alice Adams (neither of which I have read). He was on the annual best seller list nine times. Two of his books were made into films. One was Alice Adams, and the other was Presenting Lily Mars. I had seen Presenting Lily Mars, which stars Judy Garland, which is the reason I picked up a copy of this book. I can say that the film is very loosely based on the book. The movie was filmed three years before Tarkington's death and I'd be very curious to know what his opinion of the Garland-ized version was. 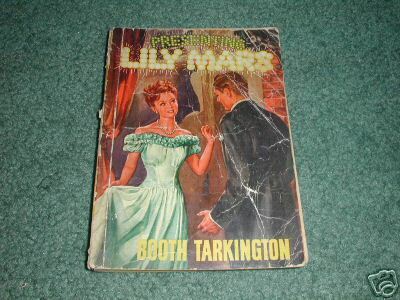 The basic story line of this book is about Lily Mars, an aspiring young actress, who gets a break and makes it into a New York production. The entire story revolves around theatre people. If you do not like theatre people, you will not like this book. What's worse, somehow, is that Lily is a 17 year old theatre girl. Theatrics galore. If you do not like theatrical teenage girls, I cannot imagine that you will like this book. (Somehow this story was far more appealing with Judy Garland singing and dancing all the way through it - and I tend to dislike film remakes. )Recommendation for a good classic movie and accompanying book: Mrs. Miniver(published 1939) which starred Greer Garson in the film version (1942). Both the book and the movie, in that case, were done quite tastefully. Lily reminded me a great deal of a 16 year old Scarlett O'Hara in Gone With the Wind. The problem with Lily is that she stays the same age throughout the same book so it feels as if Scarlett never grew up. Actually, if you took Lily and put her in Georgia, I think you'd pretty much get the picture. Since Gone With the Wind was not published until 1936 I have to wonder if Mitchell gained any inspiration from Tarkington. I don't do teenage girls very well. Hence, my general dislike of Lily. I found her flighty, ignorant and intolerably unable to listen to the counsel of others. In short, she drove me batty. I picked up a copy of this book at a used bookstore in Placerville, CA for $6.50. And for that much, I found it worth the read. However, I noticed that Amazon.com has some used copies going for as much as $30 and I'm contemplating its sale. Some books just aren't worth keeping. Intriguing. I probably won't read it, because I don't like flighty teenage girls either. Have you ever read Tarkington's *Penrod* books? I always loved those; where they involve flighty teenage girls, it's from the perspective of their bratty younger brothers, who are far more interesting.